We recently had the pleasure of meeting Stefane and Remi who came all the way from France to pick up their custom engraved weddings bands in our retail store. They were married on June 21st, 2008. Congratulations to you both! Stephane and Remi are friends of mine from Paris. They actually were living in San Francisco when I introduced them to Jeanine's collection via her retail store in May. I wear the Taylor necklace every day and I wanted to show them what the rest of her collection looked liked. 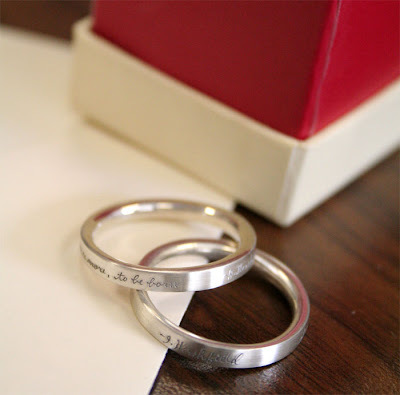 They fell in love with Jeanine's jewelry and the idea of having poetry engraved on rings. When it came time to buy wedding bands, they chose Jeanine Payer and picked out a French saying to have engraved on the Arielle ring.